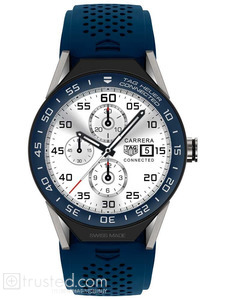 This Tag Heuer Connected Modular 45 Quartz Smartwatch features a 45mm case diameter, blue ceramic bezel, sapphire crystal glass, digital screen and blue perforated strap. Single push-button in steel with satin finish and black line at 3 o'clock. Top of push-button with horizontally fine-brushed and raised TAG Heuer shield surrounded by black carbide coating with thin transparent resin for protection. Laser engraving with 50 meters water resistant , serial number, article reference markings.